When Rocksbox contacted me and asked if I would want to review their box for you all, I didn't realize how hard I would fall in love. 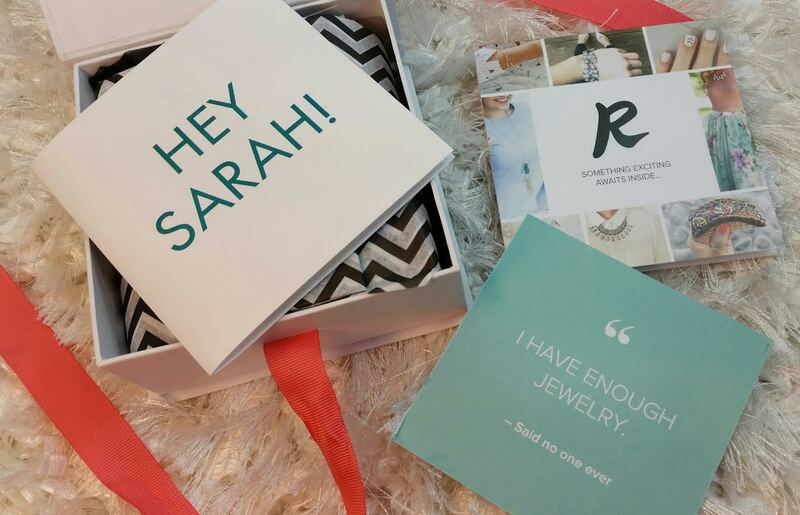 Rocksbox is different than any other subscription I have because it's a jewelry rental service. It's part of the reason I'd never tried it before but I'm absolutely hooked! They have so many designer brands and styles, it's kind of impossible not to go head over heels. The packaging is absolutely gorgeous! I love it! You'll get three pieces in each delivery. Here's how it works. You sign up on their website and use the wishlist to add things to your profile. You wishlist will give your stylist an idea of your style and if any of your wishlist items are available at the time of packing, you'll get one or two in your shipment. You can keep them as long as you are subscribed OR you can send them back and get different ones as often as you like! What You Get: The rental of three pieces of designer jewelry catered to your specific style for as long as you wish to be subscribed. You also have the option to buy at a discount and $10 of free "Shine Spend" every month. Not only do you have the option to swap out your shipments as often as you want, you also have the option to buy any or all of the pieces you are sent! 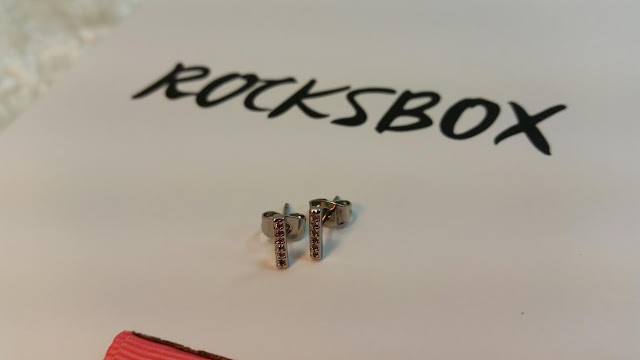 Each month Rocksbox will give you $10 worth of "Shine Spend" to use on the purchase of any of your favorite pieces. I totally did this, by the way. See if you can guess which one I bought. The quality of the jewelry I was sent is very high. Everything was sparkling and gorgeous. Perry Street Maisie Necklace- This is SO colorful and bright. When I first saw it, I was a little taken aback but when I put it on, I knew I had to wear it out. So I did! And got compliments, too. Yessss! 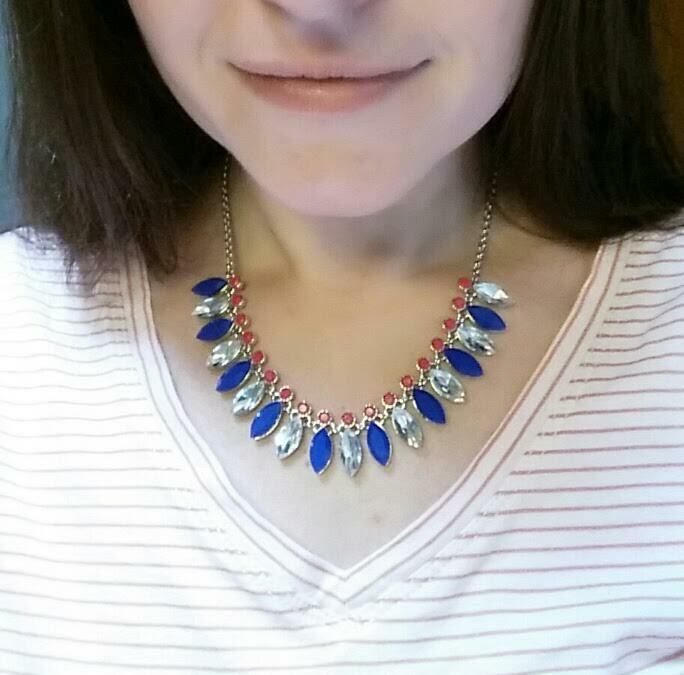 This is the kind of necklace that I think the whole "rental" thing is awesome for. Once everyone sees your statement necklace, it's time for a new one! I actually ended up wearing it more than once, just because I like the bright colors. 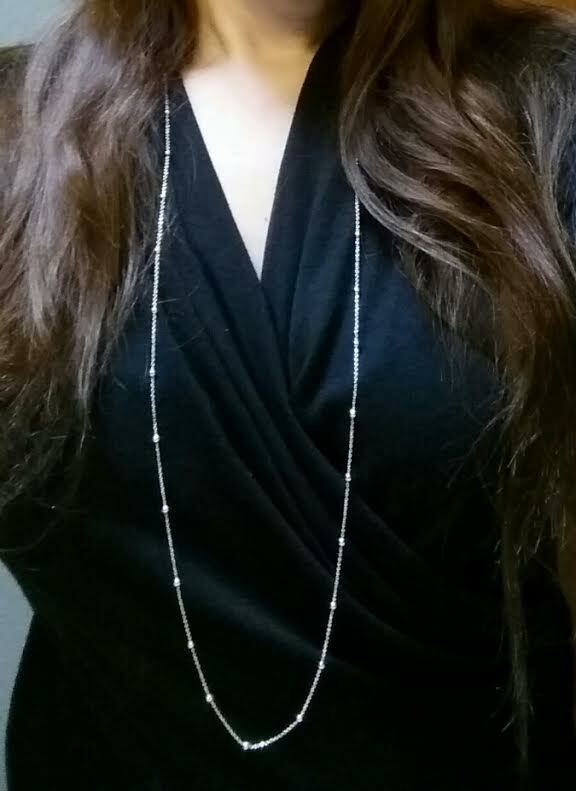 I liked that the chain was adjustable so I could wear at at the exact length I wanted. Jill Michael Ball and Chain Necklace- I adored this. I love dainty and I prefer silver. I have several longer necklaces but they're all gold. I needed something silver like this. It's so "me." Plus it's so easy to throw on with just about anything. I also loved the length and the fact that it has no pendant. Sometimes longer necklaces with pendants can be so... swingy and annoying. 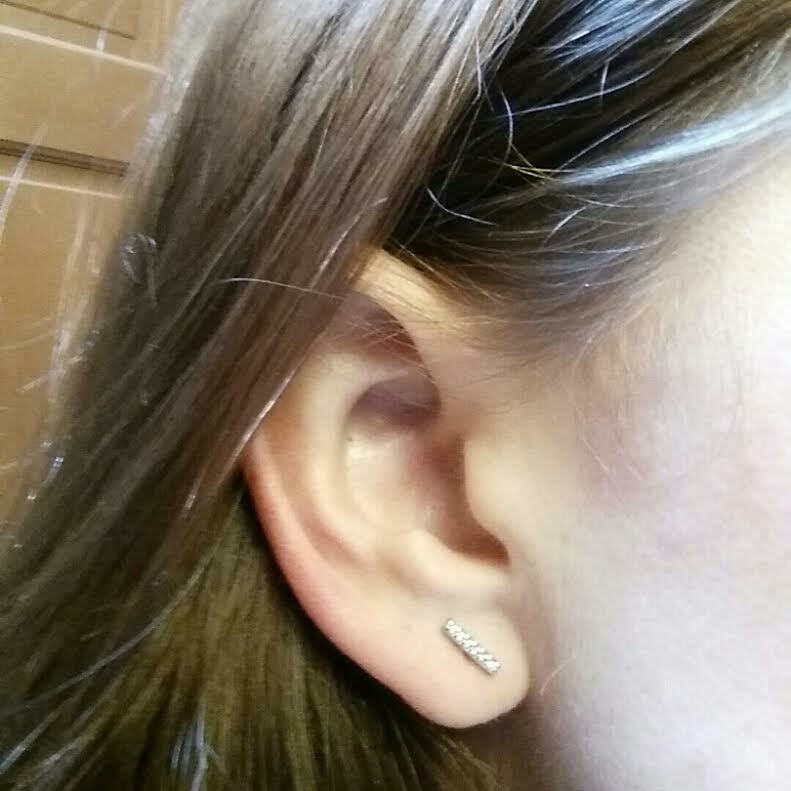 Sophie Harper Pave Taner Bar Mini Studs- I have a fairly short neck so I like to have smaller earrings. I mean, I'd love to wear super long, dangly ones or large hoops (at least back in the nineties I wanted to) but they just hit my shoulders and look weird. I really liked these because they were dainty but they were a little too small. They kinda get lost on my earlobe. I also wish they were a little sparklier. I normally stick with my diamond studs (a gift from my husband) because I'm lazy but these were actually a nice change. 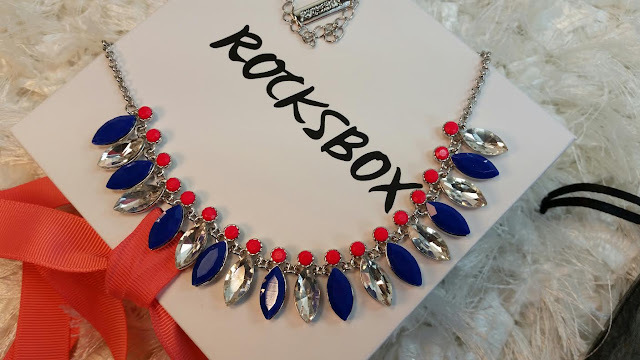 VERDICT: I think Rocksbox is a wonderful subscription and just what I need, especially for the upcoming holiday season. I tend to wear my jewelry so little that it's actually nice to get a chance to have something new to wear but not the commitment to space in my jewelry box. I did however succumb pretty much immediately to a purchase. 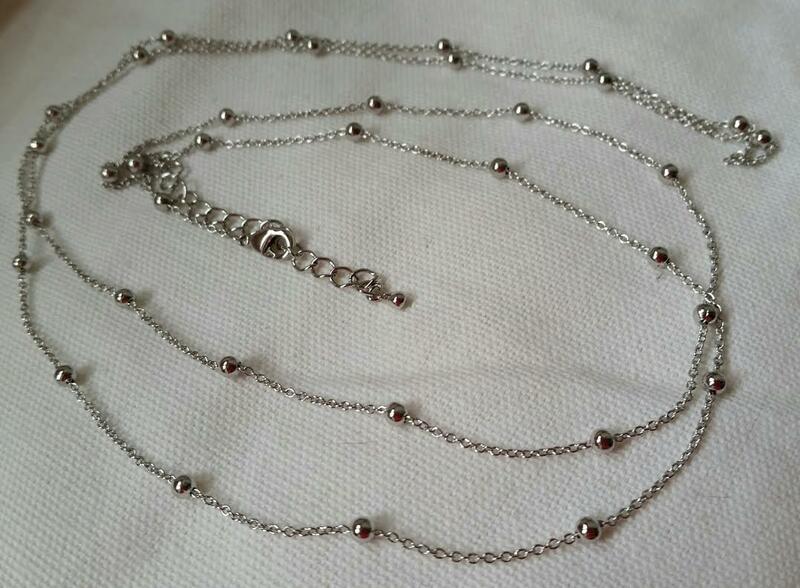 I just had to get the Jill Michael Ball and Chain necklace! Since I normally don't go out of my way to find new things, it was really nice to have high quality, beautiful pieces sent to me to wear. I found I liked wearing the Ball and Chain necklace and that it easily fit into my wardrobe. I wore it several times and then decided it was too perfect to let get away. The pieces are discounted to begin with but then Rocksbox gives you $10 each month to spend, too, so the price was quite reasonable. When the time comes to send everything back, absolutely everything is provided for you. The return envelope with prepaid shipping, the packaging to protect everything on it's way back. You don't even have to think. All you have to do is make sure to save it for when you're ready to send your pieces back. If you would like to try Rocksbox, you can sign up here. Don't forget to use coupon code bitsandboxesxoxo so that you can get your first month free!! If you need to cancel or want to buy anything, you do it right from your account with zero hassle once you've returned your set. SO nice! 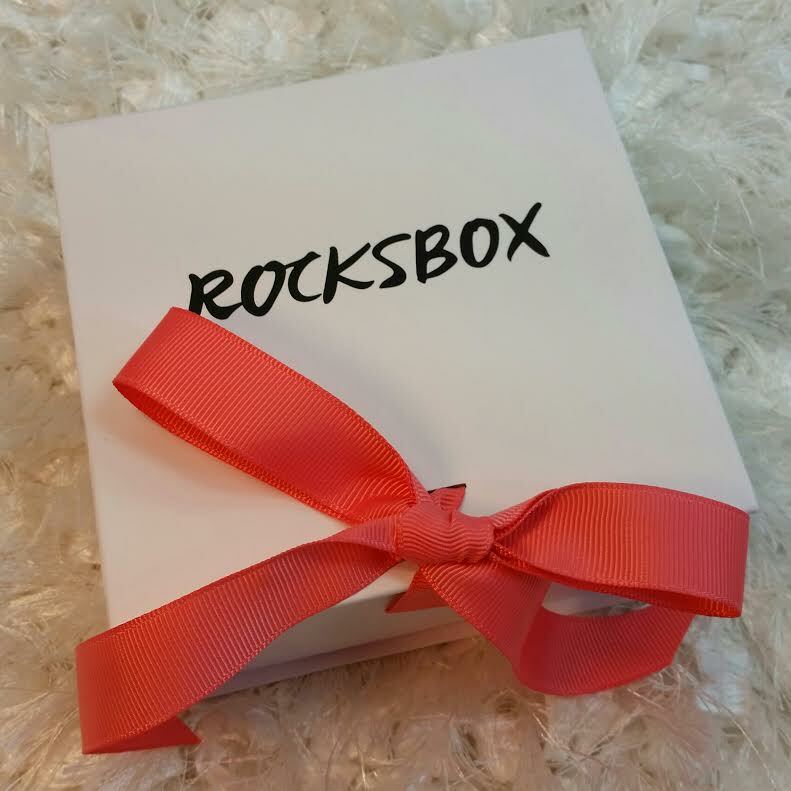 Have you subscribed to Rocksbox and kept anything? *This box was sent to me for review purposes. All opinions are my own. No compensation was received for this post. Referral links were used in this post.